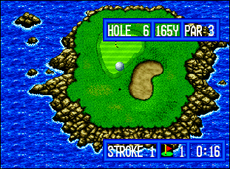 Golf, à la Neo Geo! 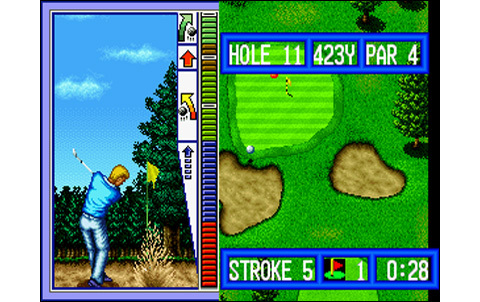 Heavyweight of its generation, big with its 62 megabytes, Top Player's Golf was the biggest game of the system when it was released. And when you pump up a little the volume, you understand why: the voices and other sounds digitizations are legion! 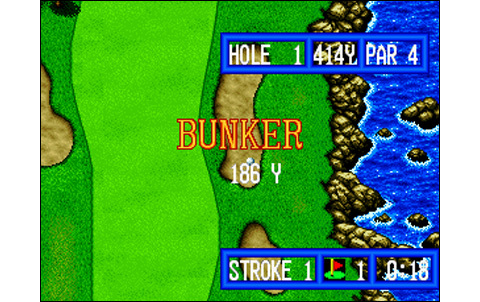 In fact, the "phenomenon" is still rare in the early nineties, as digitized sounds occupy a lot of memory on cartridges that often can't contain much. 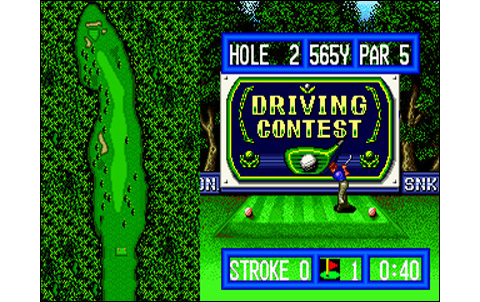 Here on the Neo Geo, the caddy lavish you during dozens and dozens of seconds with advices on each of the thirty-six holes that feature the game! 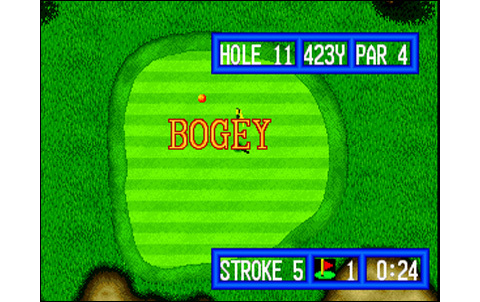 Plus the many exclamations and onomatopoeia coming from the announcer, commenting at your performances on the green! In short, TPG is lively and fun with all this ambiance. 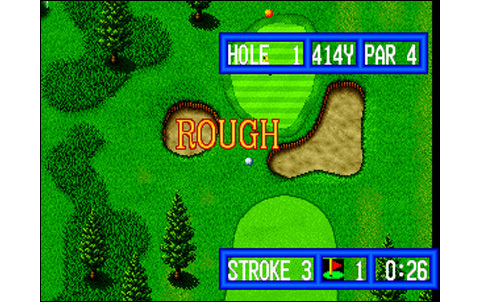 Music and sound effects are more "classical", with melodies played on a piano, catchy but discrete enough, accompanying you all along the courses, seconded with ball strike sounds, clump of grass cut, trampled grass, but also the delightful sound of the ball falling in the hole to complete the view! 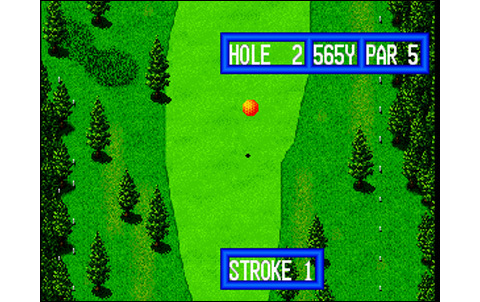 Less successful for example, the effect of the ball rising into the air... But ok, nobody is perfect, let's not blame our game too fast! 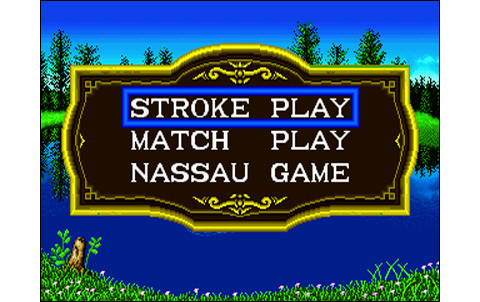 After choosing to play alone or with a friend, three gaming modes are offered: the Stroke Play, which is the event where you face all the other players, and in which only the final score after eighteen holes counts; the Match Play is a game against another golfer, hole by hole; and the last one, the most original and fun, is the Nassau Game. 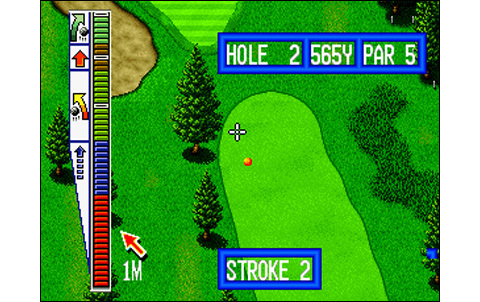 It combines these two parameters of play to win over the nine holes of the event, and also two contests, the 'Longest Drive' and the 'Closest to the Pin'. 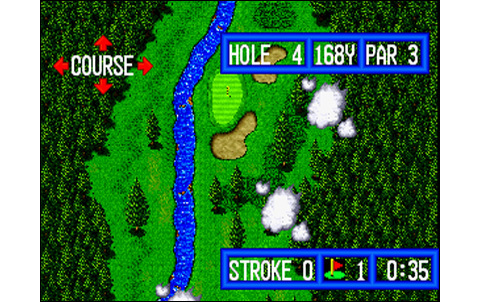 Then, you have to choose between two courses of eighteen holes and four different golfers. 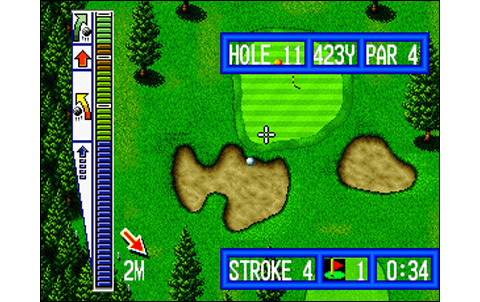 The interface is simplistic, but nothing is missing: you can browse each hole completely, and the green in a more detailed way, but also access an aerial view to properly calculate your strategies. 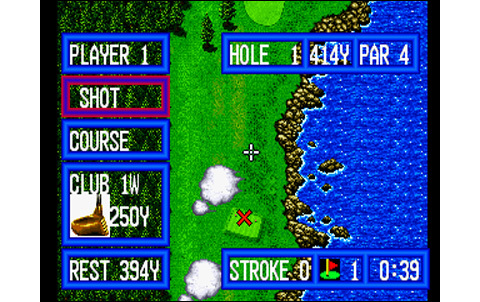 All possible clubs are available, and caddy's advice can be consulted during game play. The score sheet can also be accessed at any time by pressing D.
Let's now talk a little about graphics and animation: It's not bad at all! 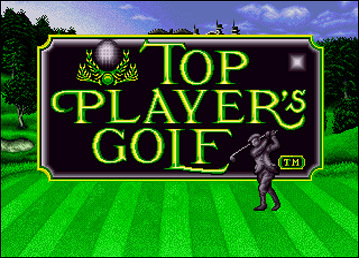 Oh yes, for sure, it's far from compete with to the majestic Big Tournament Golf, but remember we are in 1990 when TPG hits the market... The zooms are high quality and accompany the action with millimetered precision. 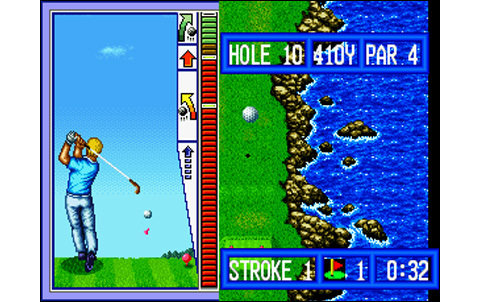 The different golfers' moves and the ball animations are smooth, just like the water, the wind and the various effects, that all are well made and surpassed at the time all that existed in this genre. Players and stages are finely drawn and the artwork gave a good slap to the competitors! As always with golf games, this kind only attracts a niche clientele, who is adept of the sport itself or literally of the golf videogame (as in my case). 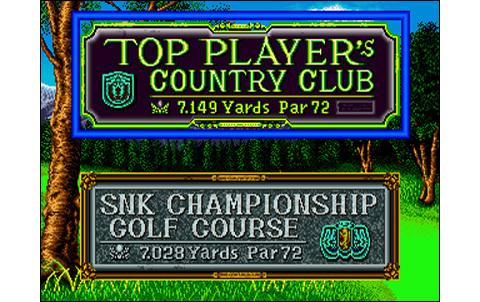 Top Player's Golf stands now as a relic, alongside the almost perfect Big Tournament Golf. However, it's still a fun game with great qualities. 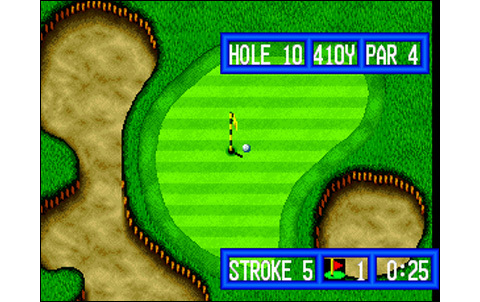 And amateur of golf games don't make a mistake: yes, it's a little stiff, not perfectly precise, and the gauge goes too fast at times... for sure, the game packs some flaws, more visible today than when it was released, back when the game dazzled everyone. Anyway, TPG remains a great piece of retro-gaming in his genre. 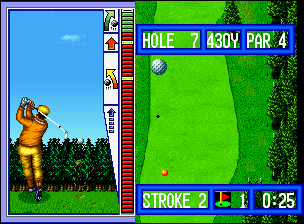 The graphics are fine and varied, the players well designed... but the colors are a little too flashy. What a pleasure, back in 1990, to see great zooms like these! Player's moves and scrollings are nicely decomposed: a great job! The melodies are not too varied but fit well the action, greatly assisted by the numerous sound effects. 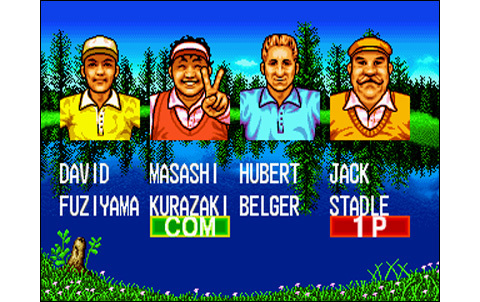 Four different golfers, three game modes, promising endless competitions for two players! 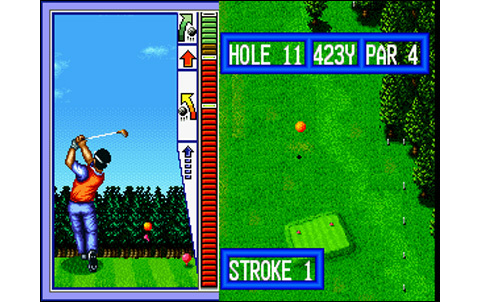 Quite complete, the gaming system features almost all golf moves and effects. The only downside is the lack of precision of the gauge.... A little training is required. 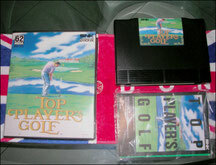 Top Player's Golf stands as an excellent golf game, alas dethroned on the Neo Geo by its successor, Big Tournament Golf. 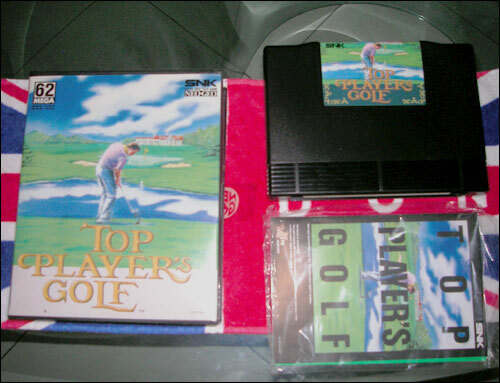 You'll find Top Player's Golf easily for about forty euros, whatever the version. 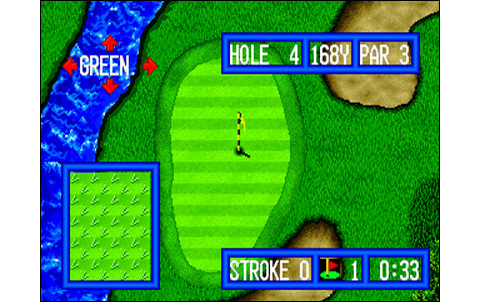 It's a golf game to book for any amateur of this videogame genre. 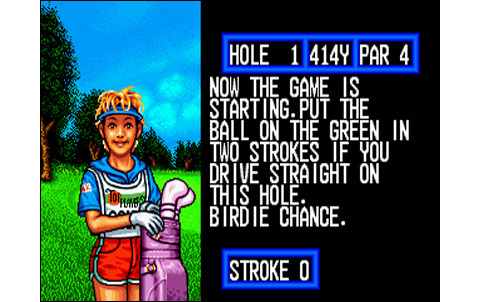 If you're not familiar with golf, it's a good way to begin.